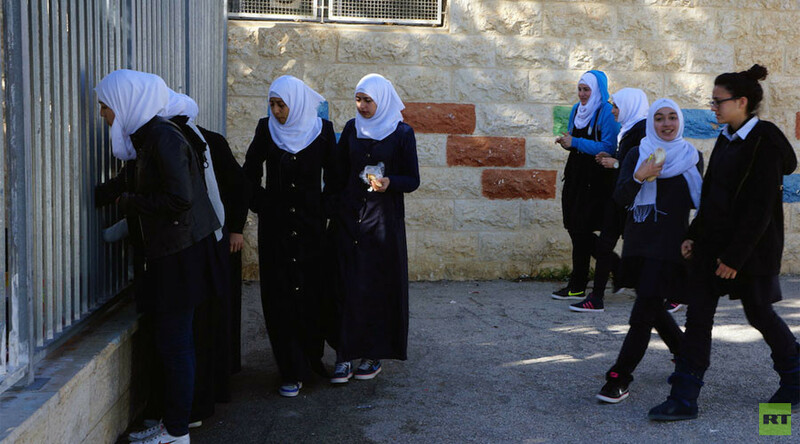 You would think going to school is the most trivial everyday business that can come to mind – however, getting an education for young Palestinians in Jerusalem is a daily battle. When I came to interview an official in charge of the education for Palestinians they ran a few extra checks on me to make sure I was not in fact covertly spying for Israel. No one in the education business is allowed to talk to journalists without permission from the Israeli Ministry of Education. 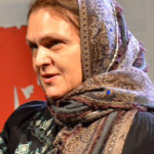 It takes more than a conventional journalist’s accreditation to get an interview, and it’s very difficult for overseas journalists to get permission. It’s completely impossible for the Palestinians to get one. Everyone here is scared to talk – headmasters, curators – with the only exception those who have nothing to lose. So no photos, no names. “Try to understand it, it’s not just about education – no Palestinian authorities are allowed to function in Jerusalem,” explains the lady who oversees Palestinian schools which do not exist. What exists here is East Jerusalem, recognized by the UN, among others, with the Palestinians and Palestinian children – but no Palestinian education. “That’s why we created our committee. We have schools for orphans. We have waqf [religious endowment] schools. There are also private schools. Operating them is very difficult. We get no help – only the opposite of it. The Palestinian Ministry of Education is in Ramallah and it has no jurisdiction here,” she continues. We are sitting in her tiny office where she shows me textbooks, maps, drawings and explains step by step how the Israeli authorities put pressure on the Palestinian education system. She outlines the situation in great detail. Prior to the occupation, all schools in Jerusalem and the West Bank were supervised by Jordan. When Israel occupied Palestine in 1967, it took over the schools. When the Palestinian Authority was formed in 1994, Palestinians took control of the West Bank schools, while in Jerusalem, Israel is still in charge. There are some private schools opening these days, but they are quite expensive and not everyone can afford them. And in any case, they are under the vigilant control of Israel. You feel this control everywhere. “We can’t ship textbooks from Ramallah to Jerusalem – they are free, they are printed by the Palestinian Ministry of Education and given for free to schools, like in all other countries of the world. But Israel does not allow any shipments into Jerusalem from the West Bank without payment documents. It’s a dead-end,” she says. Sometimes they succeed in providing the necessary paperwork for the books. But they never know when the shipment will arrive and they know they are to expect the books to arrive damaged. “They arrive all covered in dirt and torn into pieces,” says she. Trying to sue for damages is a waste of time – even if they were to win the case they’d never get the compensation, because the Army has an ironclad excuse that always works. It can say it had suspicions about the cargo, that it might be a hazard and had to run checks on it. The authorities would just laugh off such questions as to why the books had to be torn and thrown into dirt in the process. The ever-tightening control of all aspects of the Palestinians’ life, and especially of their education is part of the strategy to oust Palestinians. It’s a well-designed long-term plan. It is because of this plan that the schools are not allowed to run renovation projects, you can’t build new rooms, or new buildings or add up a story to the building, and neither can you build a sports ground. You can’t lease land to build a new Palestinian school either. And you can’t rent out a building if you want to run a Palestinian school in it. The woman I talk to says, “They blot out the Palestinian flag in our textbooks, any pictures of Israeli soldiers and any quotes from Koran. They don’t allow any stories about occupation or resistance, or about arrests and prisoners kept in jails.” The list of the forbidden items is long. There is no chance for Palestinians attending schools in Jerusalem to learn about the past, the political parties and movements, or about the resistance and its heroes. They can’t wear Palestinian symbols, or put up a Palestinian flag over their house. Neither can the schools. A man who had less concern about discussing the education system with me than others is Nahar Halaseh. He owns an electronics shop, has six children and has been a member of a parents' committee for eight years, so he knows all the details inside out. We talk in the suburban area of Jerusalem where he lives. Once in a while, a customer walks into the shop, his children or neighbors stop by. Nahar also took time to step out for prayer twice during our conversation. He holds a degree in engineering from an Israeli university and says the education he received there was good. “It’s very expensive and difficult for a Palestinian to get enrolled there, but if you do get in the quality of education is quite good,” says Nahar. He draws charts as we talk to make his point even clearer. He is only talking about the Palestinian children who attend schools “inside the wall” i.e. in Jerusalem – because there are children attending schools “outside the wall” i.e. in the territory controlled by the Palestinian Authority. The Palestinians who have it the toughest way, however, are those who are both “outside the wall” and outside the West Bank. This happens once in a while and it always comes unexpected, when the army and the settlers just decide to go ahead and push out a whole Palestinian community. And so we talk in a beautiful part of the city, surrounded by trees, hills, Palestinian houses and houses of settlers making their progress taking over. “There are 5,000 children in our village, and a total of 87,000 children in Jerusalem,” says Nahar. Nahar believes the main problem is that last figure. Half of the children go to schools which are run in rented buildings which are not equipped to be proper schools. “They have no yards, no lab facilities, no libraries, no heating. Often several teachers have to share one room teaching different subjects at a time. Teachers don’t get enough room in the administrative quarters. While the law requires the capacity of 1.25 square meters per one student, we have up to 40 students in a 25-square meter room,” says Nahar. He also points out that they have to school children of different ages together and have no separate rooms or sports grounds for girls. “After [the] Oslo [Accords], we have Palestinian education. But in Jerusalem it stays under Israeli control. And they are doing it openly. For instance, five years ago the city authorities ruled to remove certain education items they deemed to be “the source of hatred of Palestinians towards the State of Israel,” says Nahar. “We wrote a letter to the Israeli city mayor on February 10, 2014, in which we listed all of our problems.” Nahar goes on to tell me what was in the letter. “We are short of 60 classrooms in our village. Our schools are short of financing. We have financial problems with the headmasters - they steal our children’s money. Children get no activities at schools because there are neither proper facilities for that nor any funds to build them. Too many children don’t go schools at all. Too many children drop out after primary school, especially boys because they don’t see that education can make a difference in their future life,” he outlines the letter’s contents. “They have been confiscating our schools for 20 years while the city authorities do nothing to compensate the education needs of the Palestinians. Look around, there is so much land here, but we are not allowed to build anything because they announced this to be a green zone,” Nahar says as we step outside to see the vast stretches of land behind the houses. Palestinian land no longer belongs to the Palestinians – they no longer can build anything here for their needs. “Do you see all this land? But they tell us we can’t build here. They say these are natural reserves. For sure, these are the reserves for their own settlements. 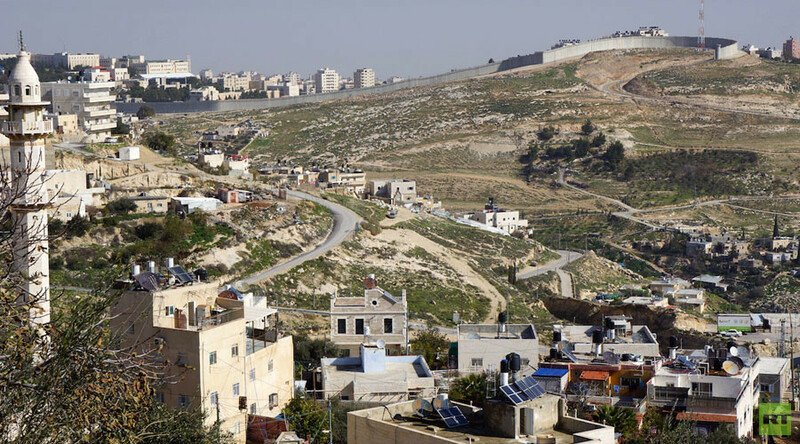 They can build all they want in the green zone, only the Palestinians can’t,” says Nahar. By ‘them’ he means Israel. Like many Palestinians, he tries to avoid saying words like Jews and Israel. The fence of one of the boys’ schools in Jabel Mukaber, an Arab neighborhood in southern East Jerusalem, is covered with photos of two Palestinians who attacked worshipers in a synagogue in Deir Yassin in 2014 – these are graduates Rassan Abu Jamal and his cousin Uday Abu Jamal. As I was preparing to take some pictures of the posters and graffiti on the fence, some high school students and teachers approached me and began asking questions. All journalists look suspicious to them. But curiosity got the best of them and students couldn’t resist the desire to chat with a Russian reporter. This is a poor municipal school. It hasn’t seen any renovations for a long time – the boards and desks are very old. The headmaster’s office is full of teachers. The building houses both elementary and high school. They are not allowed to build a second building. In a neighboring school boys and girls share one building. This is not acceptable for the Palestinians. But they also have no permit to build another facility. 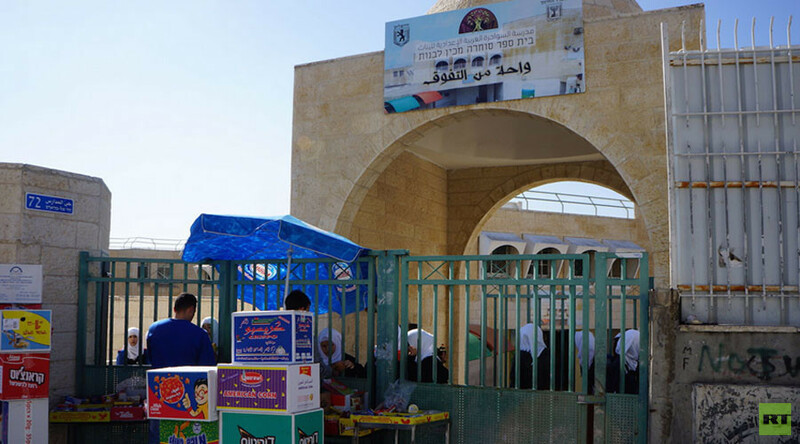 There’s yet another school where they even sell drugs, and the school authorities have no way to stop it, because the school doesn’t have security guards, and as for the Israeli police, they simply don’t care. There are no Palestinian police in Jerusalem. These schools do not teach Israeli curriculum, but Palestinian curriculum, though it is censored. For example, the textbooks cannot use the word Nakba (the 1948 Palestinian exodus) or mention refugees, prisoners or Yasser Arafat. Since the 1990s, schools are no longer state-funded. Parents have to pay 300 shekels for three years of schooling. There’s no teacher shortage. Teachers’ pay depends on their qualification and experience. Classroom teachers get 4,500 shekels, and some teachers get from 5,000 to 13,000 shekels. “We have been working for 20 years. Many of our graduates have Ph.D. degrees and some became quite famous,” says the headmaster. The shahids’ (martyrs’) pictures on the fence are prohibited, but they are still there. The Palestinian flag and all Palestinian symbols, as well as Palestinian scarfs are also prohibited. “We have no uniforms. It’s not good to wear anything that may harm your school,” explains the headmaster. “The story of Deir Yassin as well as other events of 1948 are excluded from the curriculum, but all the Palestinians know about these events from their background and from the internet,” a teacher says. “English and math are the most popular subjects,” the headmaster says. There are companies which receive money from the government to hire teachers. This is how the recruitment of personnel is done. Seven hundred students are supposed to attend this school, but we only have enough room for 350, the rest should go somewhere else. “We all pay taxes, so they must build a school for us, but they don’t,” the teachers say. “The settlements are close to our school. Some settlers may be aggressive – even children may throw stones. Israeli soldiers don’t come inside our school. Even if they arrest someone, they do it outside. The regulations don’t allow me to deal with arrests – parents and lawyers must do that,” the headmaster says. “Our school is quite good. Some of our graduates are engineers and doctors – successful people. Half of our students enter universities. We also teach religion in our school – I teach it,” the headmaster says. The school does not have a special room for prayer. Students pray at home. Currently, children stay at school from 8am to 1:30pm. The headmaster says that new Israeli regulations require children to stay at school until 3pm. After we leave the school, outside the gates I am told that for the school administration it’s just a way to make money. Teachers pretend to be teaching, and students pretend to be studying.